The UCSF Division of Geriatrics has put together an impactful PDF document focused on the need and benefits of putting geriatric patients at the center of their care. 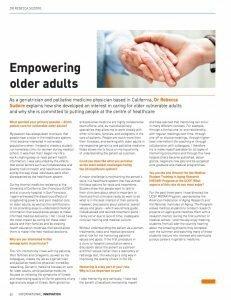 Geriatrician and palliative medicine physician, Rebecca Sudore, MD explains how she developed an interest in caring for older vulnerable adults and why she is committed to putting people at the center of healthcare. The document also showcases a new website, PREPARE, that enables patients to make more informed decisions about their medical care. The website is easy to navigate and features easy-to-understand information in both English and Spanish.